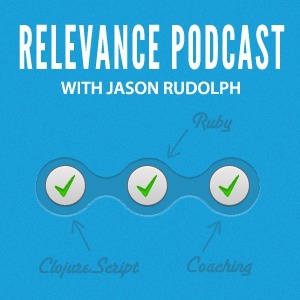 After Stu and Justin founded Relevance and started to grow it into the company it is today, one of the first things that they did was to hire Jason Rudolph. For that reason alone, I have long wanted to have him on the podcast. As it turned out, he had his premiere on the show with the Rails Rumble episode a few weeks ago. But way back in August I had already finally taken the time to sit down with him and chat a bit. Things being what they are, it has taken me until now to finally edit and publish that first episode. Anyway, we got a chance to talk about his evolving role at Relevance, his recent experiences with ClojureScript, and his life as a productivity nerd. It was fun! Download the episode here. Enjoy, and thanks for listening! Jason chose "My Humps" by Alanis Morissette as the intro, and "Good Directions" by Billy Currington to end the show. Production app, hosted on a "cheapo web server"